2.5.2 The Abnormal LDCT: What Happens Next? Forward to Tissue Diagnosis and Tests . Back to 2C Lung-RADS and Quality Control . To all writers, always remember the pen is mightier than the sword. Only if the sword is quite small and the pen is really, really sharp! Asymptomatic individuals who attend for lung cancer screening may have an abnormality on Low-Dose Computed Tomography (LDCT) imaging that results in them being referred for further imaging and clinical tests. For patients with symptoms that may indicate a primary or metastatic lung cancer, these patients usually undergo initial imaging with chest X-ray. 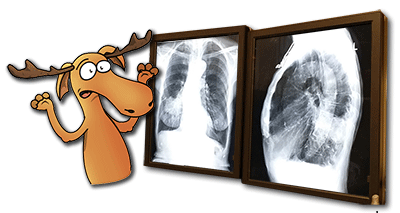 In both situations, an attempt should be made to obtain and review any previous chest imaging results as this will help to determine any associated lung abnormalities and the growth pattern of any identified lung abnormalities. Benign (non-cancerous) imaging features include solid lesions that are stable in size for at least two years and ‘ground-glass,’ non-solid lesions that are stable in size for at least three years. Did you hear about the glass blower who accidentaly inhaled? He ended up with a pane in his stomach. 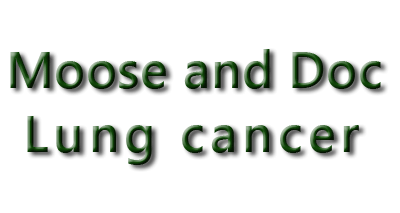 Once lung cancer is suspected or diagnosed by examination of a cytology or tissue sample, staging systems will be done. Initial patient clinical work-up can include chest CT and whole-body imaging (i.e., positron emission tomography [PET]) and can also include brain imaging. The staging of lung cancer is based upon the TNM (Tumor Node Metastasis) staging system; primary tumor (T) and lymph nodes (N) and Metastases (M) (see Section 7). Depending on individual patient preferences, an aggressive investigation approach may be taken, aimed at cure; or minimal, or no investigations may be preferred with symptom-directed treatment only. Establishing patient preferences early can facilitate shared decision-making for future diagnostic and treatment choices. There’s quite a lot about staging on here. I think there’s a whole section later. Staging is very important. It’s a measure of how much the tumor has grown and spread and how well it may respond to treatment. Moose I quite like the ‘TNM’ I have my own understanding of that; T = Time, M = Moose and N = Nap. Zzzzzzz! Imaging will guide the approach to invasive biopsy that will confirm the histopathological diagnosis and the stage of the lung tumor. Where possible, tissue diagnosis and tumor staging should be established concurrently. However, some patients will require multiple imaging studies and / or invasive procedures for tissue sampling. Although imaging and sampling procedures are usually described separately, it is often the case that the pathways to diagnosis and staging occur together. There is no single, simple diagnostic algorithm to summarize the complexity and variation in the disease patterns of lung cancer. Local resources and clinical expertise and health system factors may influence the approach taken. Every patient with suspected non-small-cell lung cancer (NSCLC) should have a thorough history and physical examination. The presence of signs or symptoms usually indicates advanced or metastatic disease and is associated with a poor prognosis. A solitary pulmonary nodule (SPN) or ‘coin lesion’ is defined as a round lung lesion < 3 cm in diameter, without any other abnormality. Lung lesions > 3 cm are called ‘masses’ and are more likely to be cancer. In 2003, Ost and colleagues reported that a solitary lung nodule was found to be present in up to 0.2 % of all chest X-rays. These researchers estimated that approximately 150,000 solitary lung nodules are identified in the U.S. each year. detection of nodule ‘growth‘ by follow-up imaging. The finding of multiple nodules in a patient with a known or suspected extrathoracic malignancy, strongly suggests pulmonary metastasis. There you go girls, I knew it was all about size. What? I’m talking about lung lesions. If they’re less than 3 cms they’re called a ‘nodule’ and if they’re bigger than 3 cms they’re called ‘masses’. 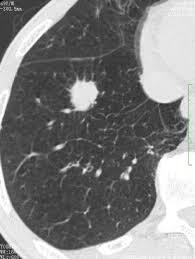 LDCT image of a central lung nodule. More references for this section are on this page..